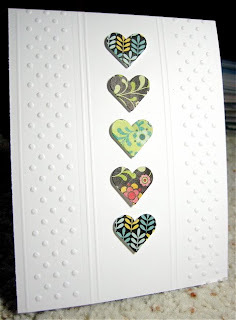 As soon as I saw the sketch for today, I knew patterned paper would be perfect for it. 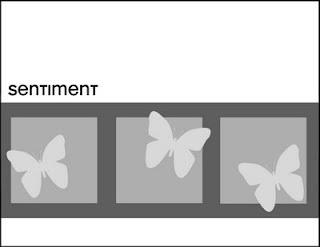 Especially those papers whose patterns are bigger or more spread out. 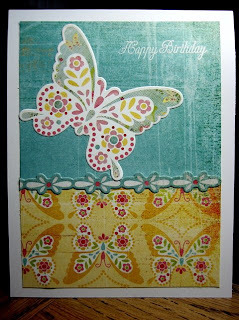 I have been waiting to use this adorable paper from Imaginisce. Lots of colors and so cute! Here's this week's sketch. I went with a square design again. 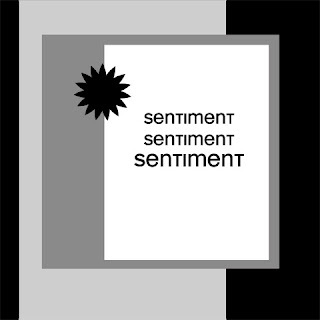 This is a design I use constantly in square or rectangle format. I use this one so often, that I was surprised to see I hadn't done it yet as a sketch. Here's my version, I've been quite pleased with the soft sky and chocolate chip colour combination lately. I picked up a Wizard while I was away, so I've been having fun seeing the difference it makes with cutting and embossing compared to the Cuttlebug. 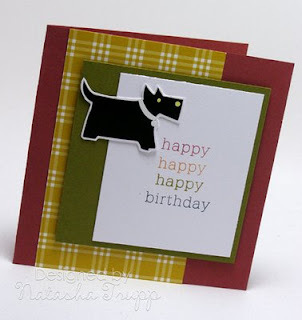 You can really see and feel the difference with the nestabilities embossing, wow! I embossed some kiwi cs with swiss dots before punching out the labels, and pulled these Making Memories brads out of my stash to actually use instead of hoard! The sentiment is from PTI. 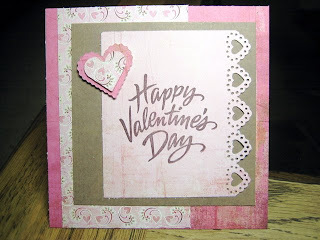 I had all these supplies out from making other cards and I got my inspiration for this card from Jennifer McGuire's blog No stamping here and I think it is pretty self explanatory so I'll just list the supplies. 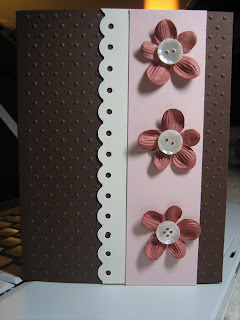 Supplies: Paper - PaperTrey; Misc - Cuttlebug Swiss Dots embossing folder, Fiskars Threading Water punch, Prima flowers, buttons, Glue Dots. This is a fun easy sketch. 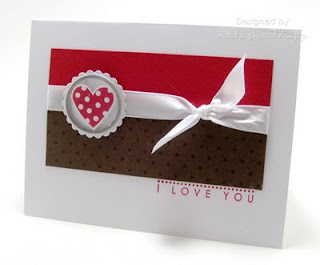 Here is one more valentine for my stash. 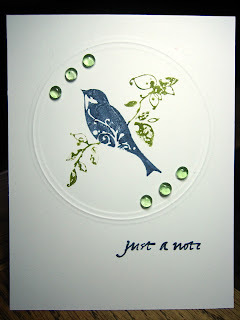 The cardstock and sentiment are from paperTrey. 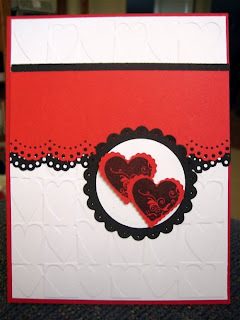 The patterned paper is Basic Grey Bittersweet. This could also qualify for 10 Minute Monday since Natasha had given me the measurements of the squares and the matted layer! 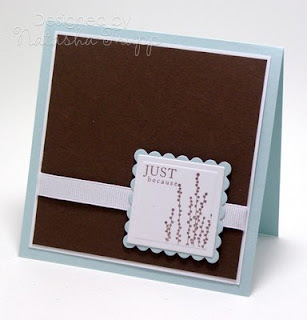 Supplies: Stamps - PaperTrey; Ink - Versamagic Jumbo Java; Paper - PaperTrey, Basic Grey; Misc. - heart punch, dimensionals. You must get tired of seeing this layout from me, but I really love it. All you have to do is change the colours and images and it's totally different each time! It's also one of the fastest layouts possible. 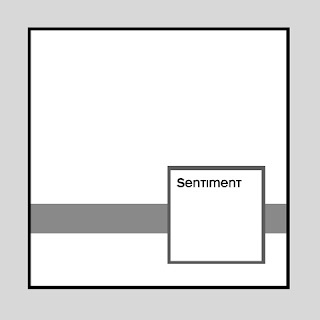 I made my main panel slightly smaller than I usually do. I usually do 4.5x3.25. This time I did 4x2.75. 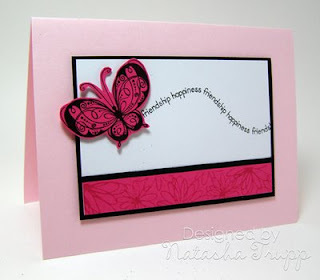 Card features new stamps from gel-a-tins (Butterfly Love and Happiness). It's time for another Fall-to Layout. 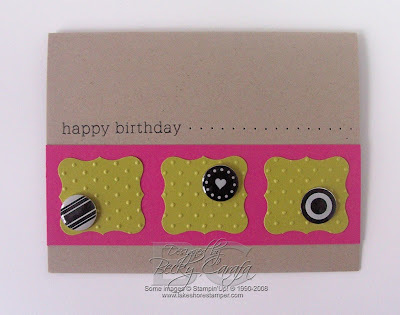 This one puts a slight twist on a very common layout- the trio of squares. 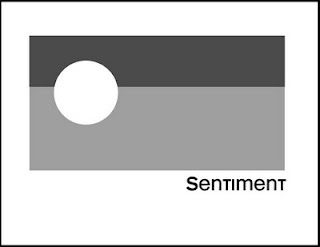 I often end up putting the strip with the squares center or near the top. I thought it'd be nice to place it lower down and place the greeting above that. Some measurements: my squares equal 1.5 inches. 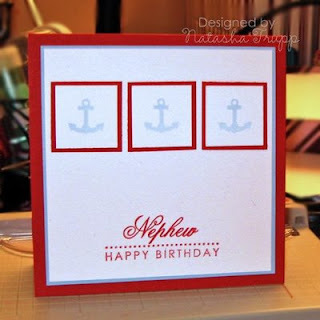 The white cardstock equals 2 inches wide. My cards are always 4.25x5.5 unless otherwise stated. 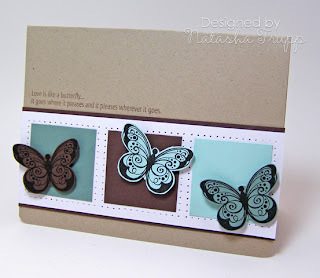 This card features the new gel-a-tins set, Butterfly Love. 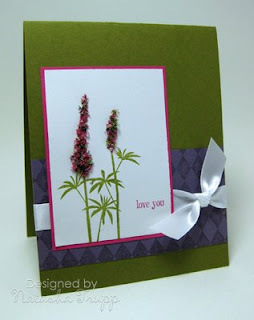 I made this card 4.25 square so that I could use a regular sized A2 envelope. 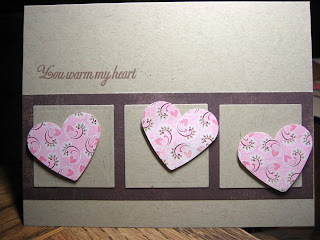 I used the MS Lace Heart border punch on the sentiment panel and my nestabilities to make the heart embellishment. 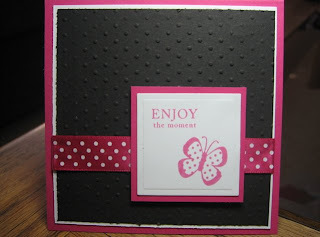 The papers are from the Basic Grey Bittersweet 6x6 pad. Supplies: Stamps - My Sentiments Exactly; Paper - Basic Grey Bittersweet; Ink - SU! Chocolate Chip; Misc - Heart nestabilitites, MS border punch, dimensionals. I decided to go with another square design. You may be happy to know that I did this sketch "properly". 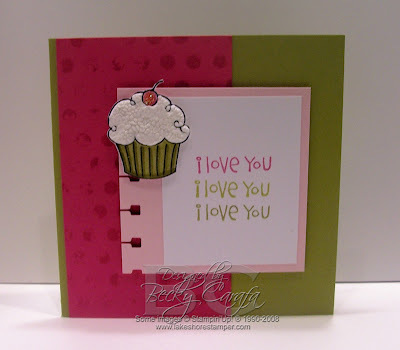 That's right, I found a card (in the latest Stampin' Up! catalog sampler actually), sketched it out, then made my own version. I was originally planning to make another heart card, but then for some reason I was going through my shoebox of rub-ons and I found this cute image by SEI. I knew I had papers from the same line, so I pulled those out and went from there. I had lots of fun with the greeting. I really must remember to do that more often, it's a great effect- repeat part of your stamped sentiment but do it in several colours. 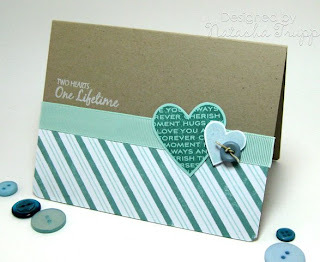 My inspiration card featured different coloured rub-on words, so I decided to give it a try too. It's time for another sketch. Once again I took the "easy" way out. I designed a card and drew the sketch accordingly. As usual, it's a pretty easy sketch to follow. Remember, I'm all about proportions. 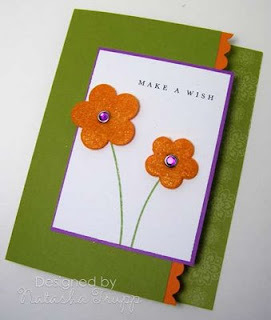 It doesn't really matter how big your central panel is, just make it proportional to the card front. I think I made mine 3.75x5. Even a bit smaller would look nice, probably all the way down to 3.25x4.5 Smaller than that and you start to lose too much of your canvas. The circle image on the sketch can really be anything. 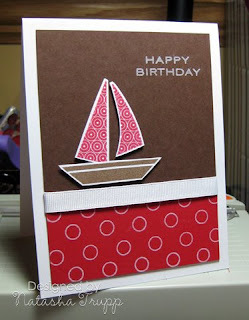 I went with this delightful sailboat from PTI's Men of Life. The stripe could be paper or ribbon. 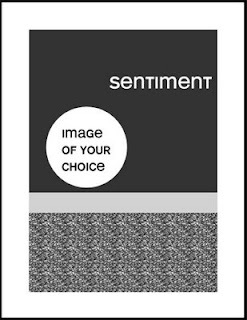 The bottom part is meant to be some form of patterned paper- whether that's stamped, like mine, or printed, is up to you! I enjoyed seeing all the cards last week! If you play, please leave a link again in the comments!